Prior to joining the Company, Chris Chipman was Chief Financial Officer & Secretary for Capital Gold Corporation, from March 1, 2006 through the company’s eventual 2011 sale to Aurico Gold for $420 million. Chris received a B.A. in Economics from Ursinus College in 1994 and is a Certified Public Accountant. Mr. Chipman is a CPA and a member of the American and Pennsylvania Institute of Certified Public Accountants. Garfield Refining, located in Philadelphia, PA, has been one of the country’s leading refiners for precious metal scrap for over 120 years. With its award-winning customer service, the Company buys gold, silver, platinum, and palladium, and sells gold and silver bullion. Garfield offers the quickest turnaround in the industry, usually sending payment within 24 hours of receiving a shipment of gold, silver, dental scrap or other precious metal material. MO: Can you talk about the challenges of keeping a 120 year old company relevant and moving forward while still holding onto its roots and history? Chris: I believe this has been the biggest challenge since I started in October 2011. Garfield has such a strong brand name within the industry and companies with such a long history typically have issues with adaptation to change. To stay relevant, we have had to evaluate and shift our focus from more traditional methods of marketing/advertising (i.e. Direct mail) to website redevelopment, social media etc. This process has forced us to focus on our history of gaining trust and loyalty from our customers as well as focus us on continuing our industry leading customer service. I believe you will see this exemplified with our new website currently in development. MO: What are some key ways that the scrap metal business has evolved or changed over last decade? Chris: I believe the scrap metal business is mainly impacted and influenced by precious metal prices. Obviously, as precious metal prices have generally increased over the past 10 years, specifically gold and silver prices, we saw an enormous amount of competition enter into the market when gold eclipsed $1,000/oz. There was a tremendous market shift whereby refining capacity increased exponentially with a corresponding decrease in jewelry demand. More competition with less scrap in the market place has result in a more challenging environment to procure precious metal ounces. MO: What influenced your decision to redevelop the company website? 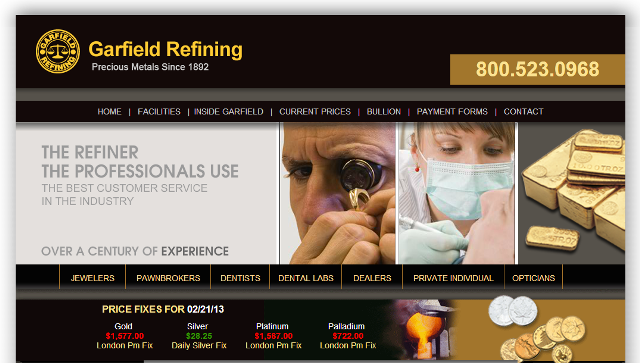 Chris: The primary reason to redevelop the website was to rebrand our image as a loyal and trusted refiner where customers can feel comfortable with Garfield meeting their refining needs. The website will make it easier for existing and new customers to navigate as well as eventually make the customer experience more interactive. We really want to make the customer experience unique here at Garfield. MO: There are so many companies offering money for scrap metal these days. What questions should our readers be asking or asking into consideration when contemplating this kind of trade? How can they protect themselves from a potential scam or unfair market value? Chris: Anyone interested in contemplating selling their precious metal scrap should deal directly with a refiner and try to avoid store front establishments. This essentially cuts out the “middle-man” (cash for gold establishments, pawn shops, jewelry stores, etc.) returning more value to the customer. Readers should have a general idea of the following before selling their scrap: 1) The approximate weight of the precious metal, 2) a general idea of what the precious metal contains (Karat, sterling, etc. ), and 3) current commodity prices in the market. MO: Can you elaborate on some of the significant strides in improving operating efficiencies and reducing costs at Garfield since your arrival in the fall of 2011? Chris: Garfield has been made significant strides in renegotiating terms with our customers and vendors which has translated to an improved bottom line for the Company. We continually review our internal processes and procedures to take advantage of operating efficiencies that become apparent. I believe this has resulted in a better work environment at Garfield and, as a result, a better customer experience. We are also in the process of upgrading our IT infrastructure which will also help with this regard. MO: Can you expand on the significance of gold prices potentially reaching uncharted highs in 2013? Chris: There are numerous factors that impact the gold price. Some of the more prominent factors continue to be monetary and fiscal policy, sovereign debt concerns, currency devaluation, geopolitical risk, etc. If gold demand were to drive prices to $2,000/oz. in 2013, I believe one of the above factors could be the main catalyst. A few examples of this could potentially be the result of additional quantitative easing by the Federal Reserve Bank, tensions in the Middle East flare up, sovereign debt concerns resurface in Europe or ignite here in the US to a higher level, currencies continue to devalue globally and central banks increase their purchasing of the yellow metal. At Garfield, higher prices would be a positive on multiple fronts, specifically better company performance and higher exposure within the marketplace.